One sold well, the other not so much. Howcome? Photo by Janitors on Flickr. The Blerg podcast, if you didn’t know, is run by Chris Lacy, an Android developer who lives in Australia. It’s terrific – Chris has a knack for finding people to chat to who really know their stuff. Still, his run of good luck had to come to an end, so he got in touch with me to talk about my analysis from August: how in Q2 2015, premium Android hit the wall (while Apple kept on growing). The podcast is now live. And here are some graphs that I cooked up to help the discussion. Feast your eyes on them as you listen. 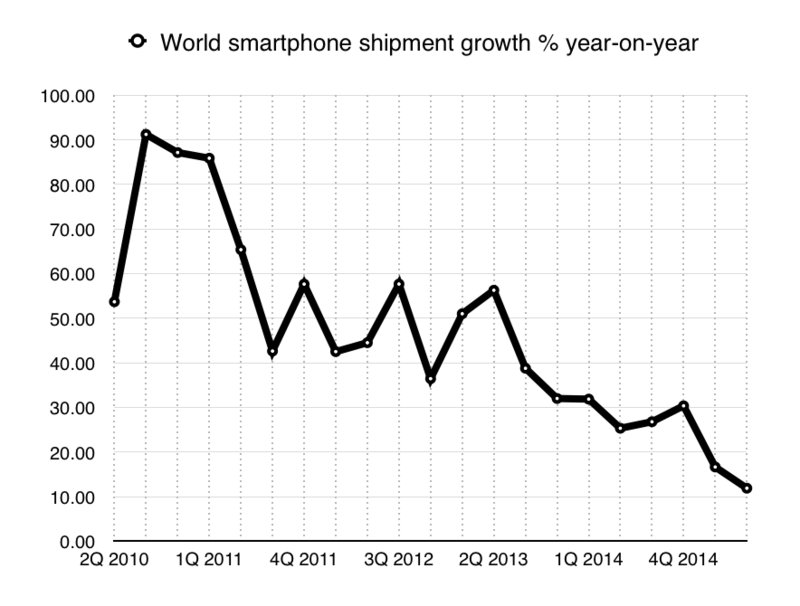 First is the graph showing year-on-year growth in quarterly shipments for all smartphones. The figures are from IDC. From dramatic a couple of years ago, it has gone to so-so. As you can see, it used to be gigantic, but in the past few quarters it has slowed down considerably. Part of that is the shine coming off China, while India and Africa haven’t yet started contributing in significant numbers. The US is slowing, Europe is slowing. 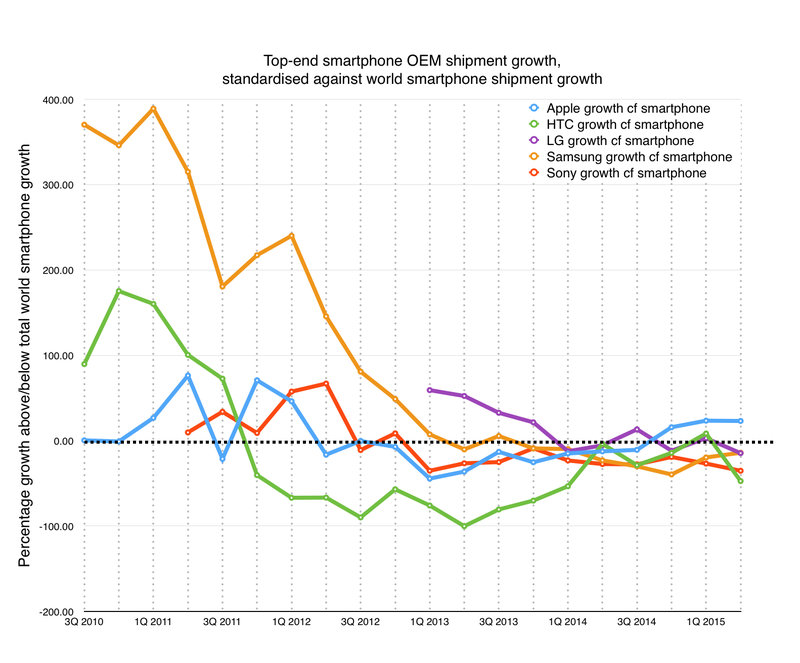 But what has happened to the top-end smartphone makers relative to the growth of the rest of the market? 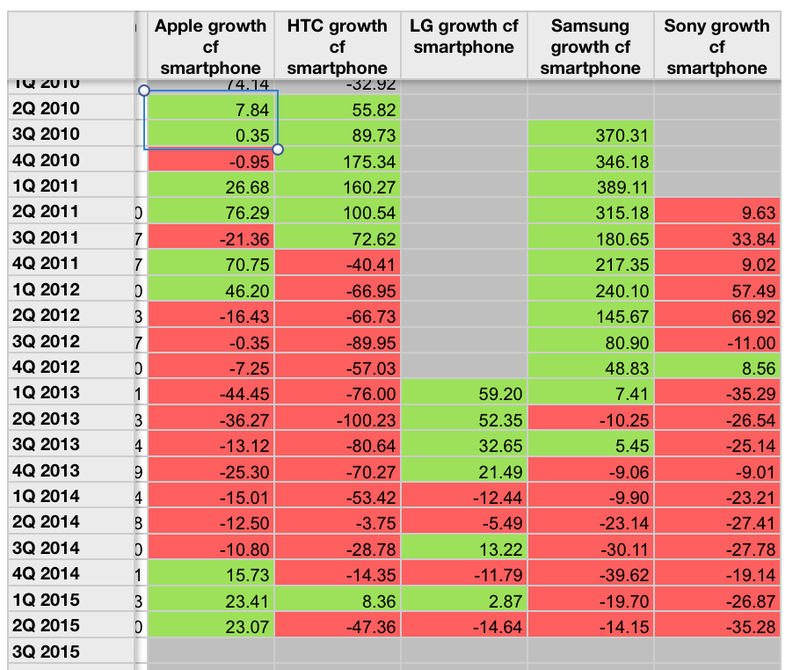 Here’s what the spreadsheet looks like if you subtract their year-on-year shipment growth from that of the smartphone market. Basically, if the cell is red, then its shipments grew less than the market; if green, they grew more. 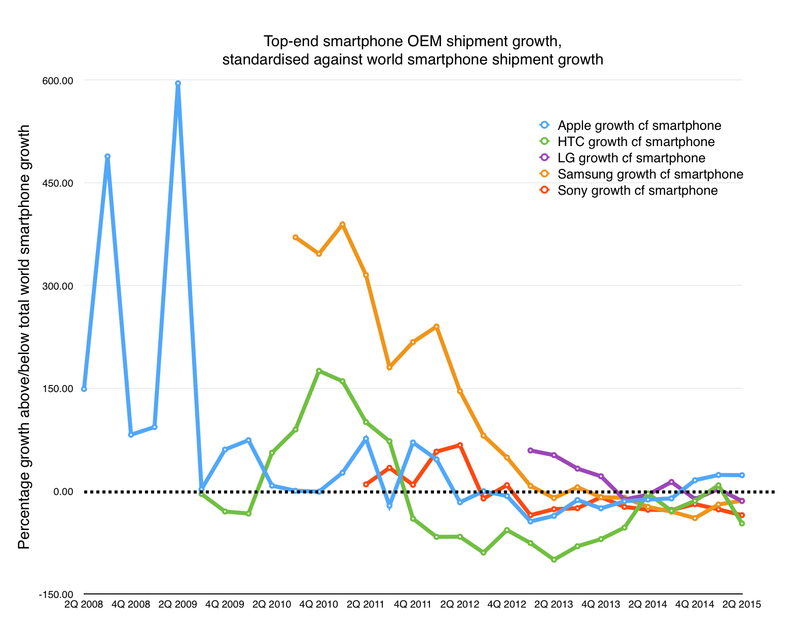 Relative to the overall market growth, which OEMs have thrived, and which haven’t? You can also graph this. There’s more data for iPhones, which is why those go back further. Not all data is available for all OEMs. But let’s zero in on the more recent quarters. What this shows is that while all the “top-end Android” companies have decelerated, Apple has for the past three quarters – ie since the launch of the iPhone 6/Plus – been growing faster than the market. Remember, this is normalised against the growth of the whole market. That to me suggests that any talk about a 4in “iPhone 6C” was dead in the water: what people want is bigger iPhone screens, and if people really want to have a 4in screen, then Apple is happy to sell them 2013’s iPhone 5S at a low, low price. And then there’s Chris’s own data for one of his apps direct from the Google Play store. 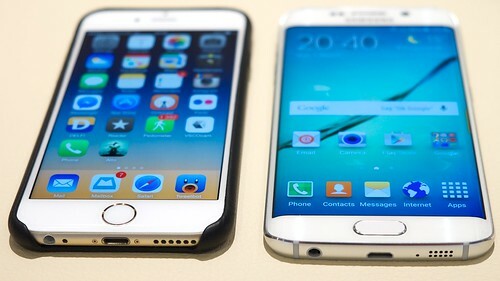 Notice how few phones there are from 2015. Look down the list, and what do you see? 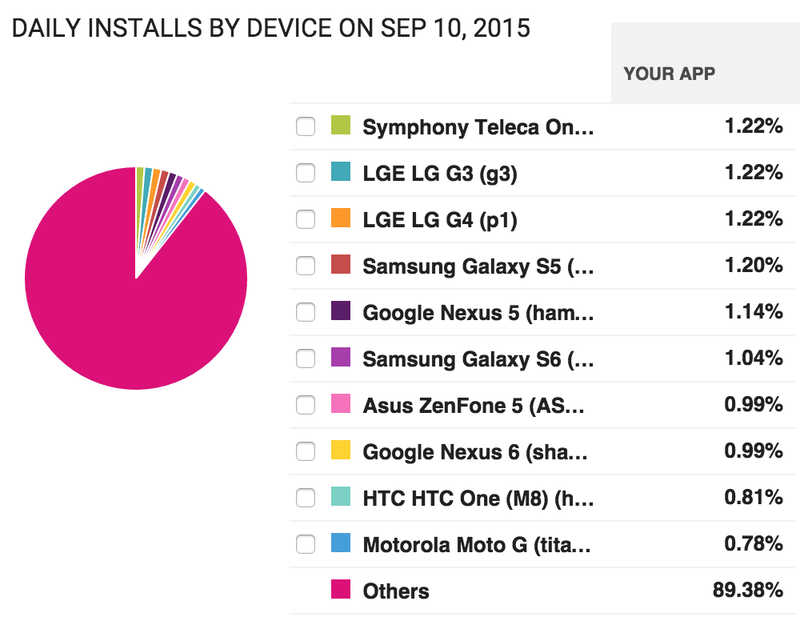 Most of the downloads come from phones which weren’t released this year. What does that mean for the “premium” Android handset makers though? Chris and I work through this, including discussions about why there isn’t a 32GB iPhone 6/6S/Plus, where all the buyers have gone and what the future holds for people like Chris, who make paid-for apps that you’d expect “premium Android” buyers to be purchasing. Hey! If you enjoyed the podcast, why not subscribe? You should be pretty safe from hearing me again for a while.